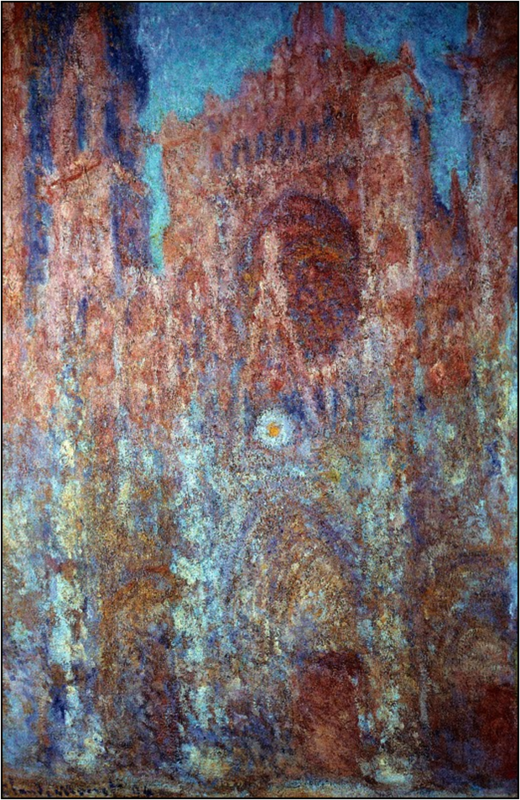 "Monet causes that even the stones come to life." 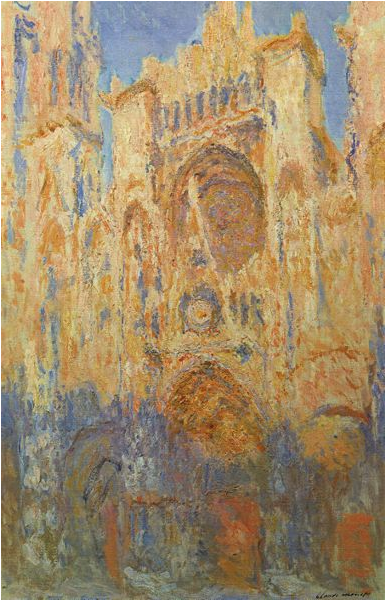 As a way to take Impressionism to the next level, Monet had started to do studies on the effects of light and atmospheric changes on the form and color of a specific subject. He started this quest with the 1886 Belle Isle paintings where he worked on the same motif from perspectives with very few variations. 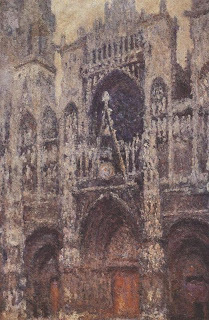 His later Grainstacks Series from 1890-1891 and Poplar Series from the spring, summer and fall of 1891 were more calculated and focused works, painted several canvases at the same time, with an intention towards being exhibited as a series, together. After his Poplars Series, Monet wanted to start to work on another motif. For his new Series he took an architectural subject and represented it's facade in over 30 canvases, during different times of day and weather conditions, Rouen Cathedral. 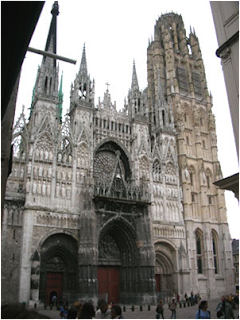 The Cathedral was one of the major monuments of Gothic architecture, a style that started in France and then spread throughout the rest of Europe in the Middle Ages. 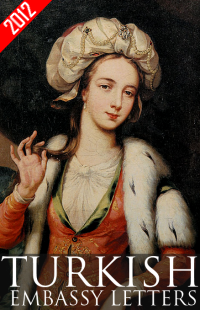 In this aspect, the paintings can be looked upon as a praise to French history and culture. 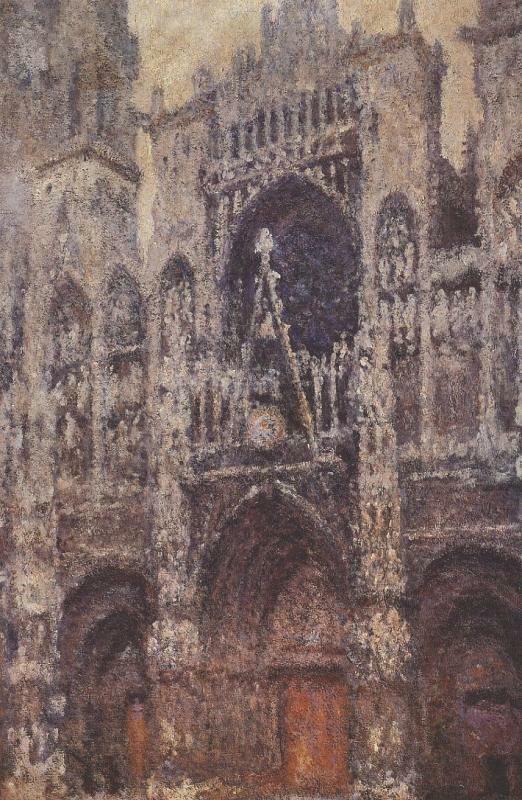 Monet was again, touching upon nationalism. 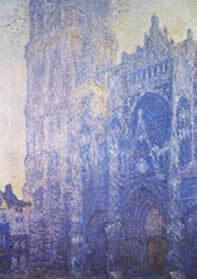 The dating for this series is a little confusing since he did two campaigns in 1892 and 1893, that he started in the winter when it is difficult to paint outdoors, from the window of rented rooms directly opposite the Cathedral and finished them by 1894, in his studio back at Giverny. He worked on several canvases at the same time, moving from one to the next with the changes of the sun and the weather. By representing the facade of the building without any depth, it became just a backdrop to best capture the light and atmosphere emanating around the building. He did not even try to represent any of the details like the sculptures on the facade of the building, he just wanted the effects of air and light. Monet used color to unify the paintings; the color lavender can be picked out in most of the canvases. This was a very challenging project and he was distraught while working on the paintings. He worked on several canvases simultaneously that he had setup in front of his window and the changing weather and light conditions were causing him to move from one canvas to the next. He complained to his wife and dealer about the weather and how he had set himself up for an impossible situation. Part of the reason he was having such a difficult time finishing these paintings might have been due to the events that were going on in his personal life. 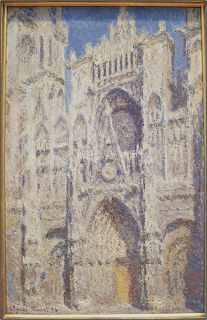 He had gotten married to Alice Hoschede in 1892 after both of their spouses had passed away and they had been living together since 1878 as an extended family - Monet had two children from the late Camille and Alice had six from her first husband. He had also bought the house in Giverny. But Monet's unrelenting obsession led him to finally finish the series and achieve instantaneous success with the the critics and collectors as soon as they were exhibited. He was able to buy the land and the house in Giverny and build his studio and famous gardens from the sale of his series paintings. 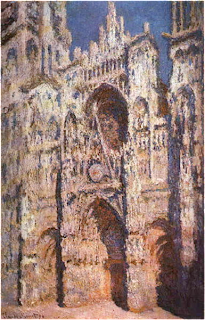 Monet had conceptualized and exhibited the Rouen Cathedral paintings as a series. He was very disappointed that he couldn't sell them as a group. As a result they are actually dispersed throughout different museums all over the world from Musee d'Orsay in Paris, Art Institute of Chicago to the Metropolitan Museum of Art in New York. One of the best ways to experience the whole concept of what Monet had accomplished and see the works in its entirety is to look at a project Colombia University Visual Media Center has worked on http://www.learn.columbia.edu/monet/swf/ .